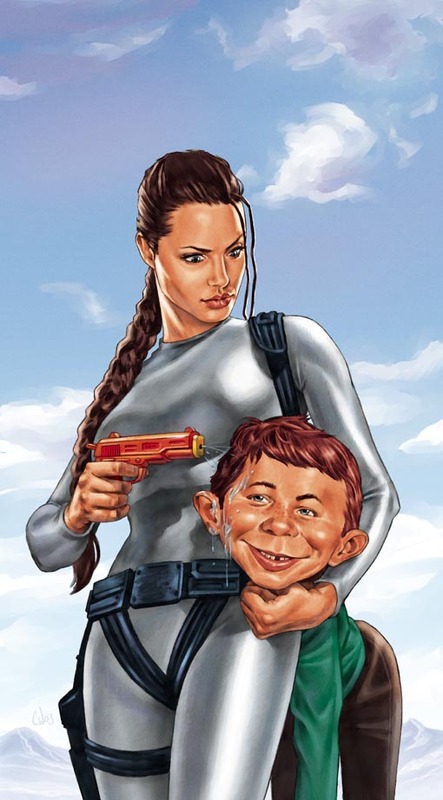 Here's my MAD Tomb Raider cover from a few years ago, using the same painting method from my tutorial. I've also included the pencils and some detail shots. Since completing this piece I've refined my methods slightly. The main difference is I now lighten my dark pencil edges when they occur near strong highlights (see detail of Lara and you'll notice the linework on the edge of her face is quite dark). In Photoshop, I use the brush on 'Lighten' mode to achieve the lighter lines. I'll eventually revisit this piece and just fix up those little indiscrepancies. Hey Chris, this has to be one of my all time favourite piece of yours! I think it's downright awesome!! Seeing how detail your pencil version is is a treat and a sight to behold. It could only be funnier if she was lactating on him..
Ahem! Anyway, this is a great piece of art, Chris. I also dig the commentary you added. Showing off the art and teaching us a thing or two. Sweet!